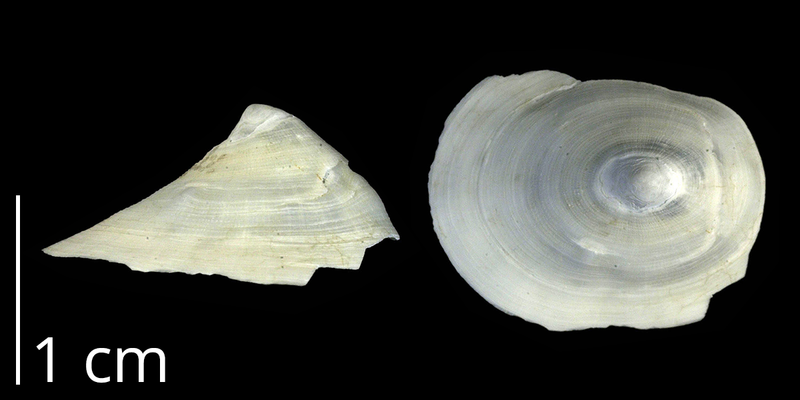 Cocculiniformia are deep sea gastropods that have limpet-shaped shells (see example below). There are about 50 modern species and an unknown number of fossil species. Some modern members of this clade have a bizarre lifestyle: they feed exclusively on the beaks of decaying cephalopods (see Hartmann et al., 2011). The relationship of Cocculiniformia to other major groups of gastropods remains uncertain and awaits molecular testing. A specimen (USNM 896645) of the extant species Cocculina superba, collected southeast of the South Orkney Islands, Antarctica at a depth of about 3250 meters. Information provided with the permission of the National Museum of Natural History, Smithsonian Institution, 10th and Constitution Ave. N.W., Washington, DC 20560-0193. (http://www.nmnh.si.edu/). Gofas (2009) recognizes the following gastropod families and genera as members of the Cocculiniformia. This list was copied from the World Register of Marine Species (WoRMs) on March 3, 2017 and is reposted here in concordance with the source material’s Creative Commons BY 4.0 license. The link associated with each name will direct you to additional information about that taxon on WoRMS. Gofas, S. 2009. Cocculiniformia. Accessed on March 3, 2017 through WoRMS at http://www.marinespecies.org/aphia.php?p=taxdetails&id=156482. Hartmann, H., M. Heß, and G. Haszprunar. 2011. Interactive 3D anatomy and affinities of Bathysciadiidae (Gastropoda, Cocculinoidea): deep-sea limpets feeding on decaying cephalopod beaks. Journal of Morphology 272(3): 259-279. Link.